Any chance of you mocking up an adapter to actually run a Revo slipper instead of a spool for the GTP's and one using the Rustler slipper for the RCM CRT.5? hahahha. I would need to get me new pair of 6S lipos to run some crazy speeds. I don't know if I have a motor that would be able to turn 34T pinion with a 34 spur in a GTP. Received my spool today. A 40T spur was added and I think a 34T will fit, which I will check later. Mike, I had ordered a front motor cover as well, but didn't receive it with my spool. i got mine today also!! thanks mike. now she"ll either go or blow!! Here is a pic of the 34T pinion and 34T spur. Last edited by snellemin; 03.30.2012 at 06:55 PM. Very strange tooth shape on that spur, are they both mod1? Suppose to be. That spur was on my Rustler for a bit. The difference in tooth shape is something I've observed on spurs and pinions from different manufacturers- the tips are more tapered sometimes, but they should run/roll against eachother just fine if you use your fingers to test, so no worries. I think the traxxas spurs have a differant preassure angle. Where do you see the spool in the store? I've looked and can't find it. The Traxxas spurs Mod1, but as somenone mentioned, they are indeed a different pressure anlge. Traxxas Mod1 gears are 14 Deg. pressure angle, while everyone else uses 20 degree pressure angle. 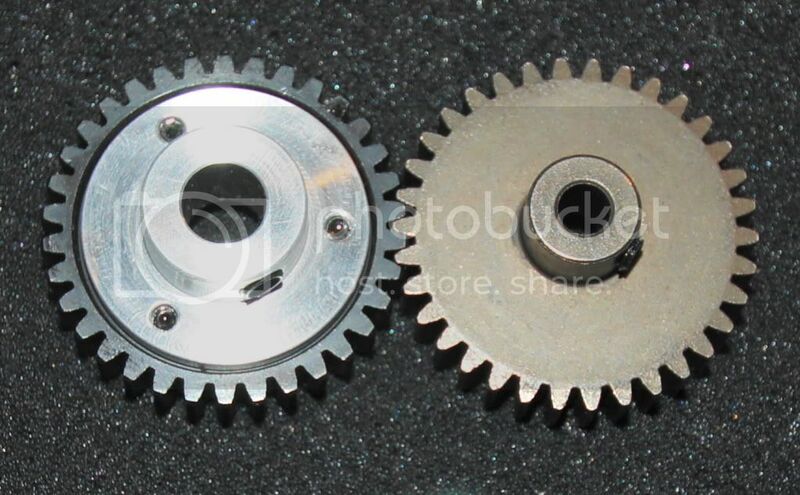 If Both gears were metal, they would very likely wear prematurely and make some noise, but plastic to metal works fine.